Inking It Up With Cathy: Happy New Year! I hope you had a wonderful holiday season. I certainly did! We just sent Cassidy back to Montana last night so now I am back to blogging for you. To catch you up, today's card is one from one of my December workshops. 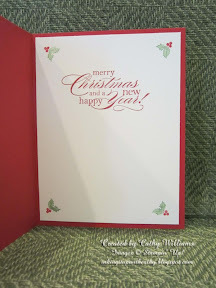 You probably are tired of Christmas cards but this card can be altered for any occasion. The cool thing is that you can add a picture to personalize this card. 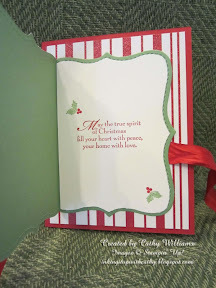 Thank you to my friend Becky Roberts for the inspiration of this card. 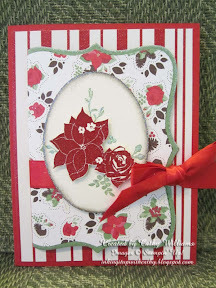 The card is made using the Pines & Poinsettias stamp set and the Holly Berry Bouquet designer paper. Both of these items, unfortunately, are no longer available but I am sure that a creative person like you can find another set and paper that will work. When you untie the ribbon, you open the Top Note portion of this card. Here, I stamped a sentiment from the Snow Swirled stamp set but here is where you can use a photo by just running the photo through your Big Shot using the Top Note die. Finally, here is the inside of the card which includes a sentiment from the Delightful Dozen stamp set. New Upcoming Product from Stampin' Up!